What’s up between Henrik Fisker and Aston Martin these days? Drama, man. Drama. Fisker, he of the modified BMWs and the modified Mustangs and the oddball that I personally love known as the Fisker Karma, came out with a design for a modified Aston Martin about a year ago. Aston threw a fit, essentially claiming that Fisker didn’t modify an Aston so much as copy one and claim it as his own, so Fisker promised not to make his Aston. 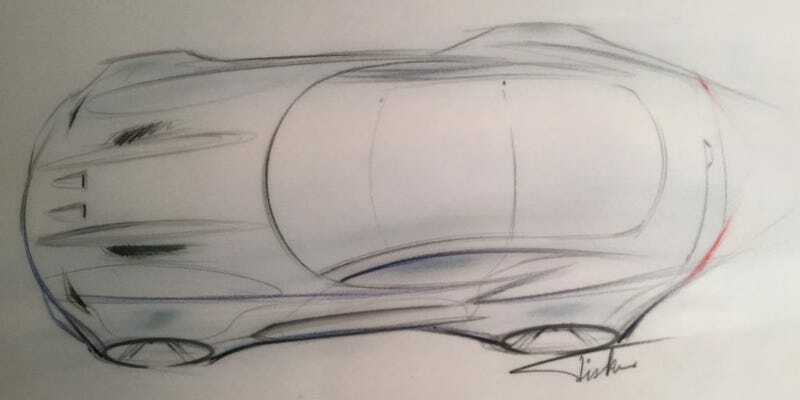 And then Fisker came out with a sketch for a design that was Totally Not An Aston, called the Force 1, and to drive the point home Fisker made sure to say the word “American” four different times on his website. (Stops to breathe) Okay then. But Fisker’s suit is actually just the tip of the legal iceberg. Long before Henrik Fisker designed the vehicle in question here, he was actually a designer for Aston Martin itself, and penned stunningly gorgeous works like the Aston Martin DB9 and the Aston Martin Vantage with Ian Callum. And in the same decade when he was doing that, he also designed new bodies for Mercedes and BMWs, resulting in cars like the Fisker Tramonto. So you might go as far to say that Aston and Fisker both have a pronounced design language, and since a few Aston designs were penned by Fisker himself, it wouldn’t be unusual that some Astons end up looking like Fisker designs, and some Fisker designs end up looking like Astons. Having your own personal style is one thing, and that’s alright. Actually going ahead and copying yourself, however, is not alright if you don’t own the rights to whatever it is you created (as is alleged here) and the person who owns the rights of it feels you are copying. It sounds complicated and convoluted, and it is, but you can be sued for being too much like yourself. Just ask John Fogerty, who was sued for sounding too much like John Fogerty. And here we have a serious conundrum. Does the Force 1 look like an Aston Martin? Or does the Force 1 just represent Fisker’s personal style? The car depicted above is of concern to Aston Martin because it is strikingly similar to several of Aston Martin’s cars, including the DB10 car (the James Bond car). Or maybe not, because the sketch up top isn’t even the final version of the Force 1. So does Fisker’s Fisker look like a Fisker? Or does Fisker’s Fisker look like an Aston Martin, whose stylistic underpinnings look to be influenced by Fisker, at the very least? And does Fisker even have a right to produce cars that look like Fiskers of the past? But Fisker’s lawsuit doesn’t even go as far as asking those obvious questions, and instead, what it essentially does is concede that Henrik Fisker’s design isn’t very original. It cites the long-hood short-deck designs of the Jaguar F-Type and Chevrolet Corvette, as proof that the basic design doesn’t belong to Aston Martin. But are they different at all? Or is it just too much? That’s for a court to decide, I suppose. Or for very expensive lawyers in a room to decide.